Seventeen-year-old Agnes (not her real name) was married three months ago to a man she had never met. "My parents sat me down and told me I was no longer their responsibility. They wanted me to move out and start a life of my own," she recalls, sitting in the village of Chibombo, two hours' drive from Zambia's capital Lusaka. "Things moved faster than I expected - when a stranger paid a bride price to my parents. I had no say in the matter," she says, tears welling in her eyes. "I didn't choose this life and I'm not happy here." Agnes agreed to speak on condition that we do not identify her. The BBC was also able to speak to her because her husband was away. Wearing a striped T-shirt and a colourful sarong, she has a nervous and sad manner about her. When we met her, she was going about her daily chores, washing dishes, cleaning and then starting a fire to prepare the evening meal. It is not difficult to see how desperate her life is, her heels are cracked, her nail polish is wearing off. 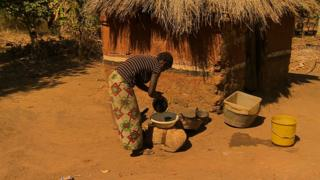 Early and forced marriages are common in Zambia. But this traditional practice doesn't just happen in Africa, it's a problem globally. It is estimated that 14 million girls are forced into marriage before their 18th birthday every year - causing their childhoods to come to a sudden and unexpected end. Agnes is desperate to escape her new life but fears that her parents would disown her for the disgrace that comes with being a run-away bride. Poverty and tradition are said to be behind this practice, which is most common in rural areas. Parents see their daughters as a source of income and even wealth, those opposed to the practice say. But even here, some are beginning to speak out against the practice. Chief Chamuka VI of Zambia' Lenje people wants young girls to be kept in school. He has summoned his subjects to a meeting under a giant tree. The villagers sing, shout his clan name and clap as they see their chief approaching. He commands respect. Community members who attended the meeting didn't disagree with anything he says. Chief Chamuka, dressed in his traditional regalia - a black and red robe with a matching hat with feathers on it - addresses them about the dangers of child marriages. "In my chiefdom, the stance which I have taken is that no parent shall force a girl below the age of 18 to be married. A parent who does that will be severely punished," he says. Traditional leaders who denounce early marriage are usually frowned upon by those who believe they are defying old customs and norms that have been passed on from generation to generation. But the chief's conviction seems unrelenting. "I feel that in our communities there are certain customs and cultural practices that are good and some are bad - this has to stop," he says. Those forced into child marriage feel the effects for the rest of their lives. Beatrice Chikwekwe got married when she was 15, she is now 32. "I was terrified and confused on my wedding day, I didn't even know what I was doing," she says. "I fell pregnant the same year and had complications while giving birth. I nearly died." Ms Chikwekwe is doing her final year at the local college of agriculture, trying to make up for the time she lost. For many though, there is no fairytale ending. Campaign group Girls Not Brides says child marriage traps girls and their families in a "cycle of poverty". "Girls who marry young do not receive the educational and economic opportunities that help lift them and their families out of poverty," it says in a statement. Graca Machel, widow of Nelson Mandela and one of the group's patrons, told the BBC that traditions are not set in stone. "Traditions are manmade and harmful traditions must be changed. As parents we don't have the right to dictate the choices that our children make," she says. "We need to change the way families and communities view a girl. The girl-child needs to be seen as a full human being with dreams, aspirations and with the ability to thrive to the highest potential just like a boy-child." It is estimated that girls who become pregnant before their 14th birthday are five times more likely to die while giving birth. Back in Chibombo, aid agency Plan International Zambia is working with traditional leaders, government and other groups to rescue girls like Agnes from forced marriages. "Where there is poverty, children are prone to abuse. We are working on educating communities about children's rights which need to be respected," says Plan spokesman Lazarus Mwale. With her voice trembling, Agnes sums up her dilemma. "Sometimes it is hard to defy our parents because it is disrespectful, but we can't continue to allow them to make choices that are bad for us," she says. "It was my wish to finish school and become a nurse but I guess that will never happen because my husband won't allow me to further my studies."